I'm considering reading this one. 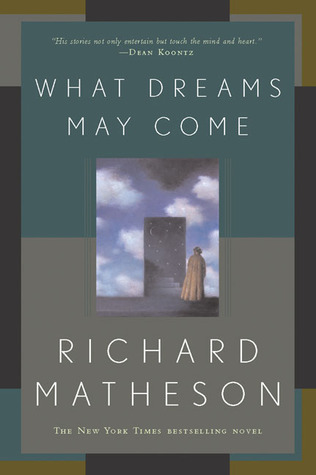 This was published in 1997 and I always enjoyed the premise of the 1998 movie, What Dreams May Come, starring Robin Williams, Annabella Sciorra, and Cuba Gooding, Jr., but I particularly loved the beautiful visual effects within the film. What do you think? Have you read this one? "Begin at the beginning" is the phrase. I cannot do that. I begin at the end - the conclusion of my life on earth. I present it to you as it happened - and what happened afterward. A note about the text. You have to read my writing, Robert. This account may seem unlike it. The reason - I am limited by my transcriber. My thoughts must travel through her mind. I cannot surmount that. All the grains will not pass through the filter. Understand if I appear to oversimplify. Especially at first. Based on that paragraph, I would totally read this one. The writing seems so fluid and so graceful to me. I hadn't heard of the movie or the book, but now I know that I am going to need to do a little digging. Excellent first paragraph! I haven' heard of the movie or he book, but the beginning paragraph would pull me into the book. Here's a book tease from my current read. This opening is very intriguing! It made me laugh, too, because the first chapter of Her Fearful Symmetry (which I started last night) is titled The End. I am enjoyed the movie more for the visual effects than the story, but based on this chapter I would continue reading. I've never heard of this one before but I am intrigued.